Money Matches and Exhibitions will be streamed after tournaments are done. All tournaments are ran on PS4 and with standard EVO rules. SETUPS ARE ALLOWED AT THE VENUE, WE ENCOURAGE ALL GAMES TO BE PLAYED! 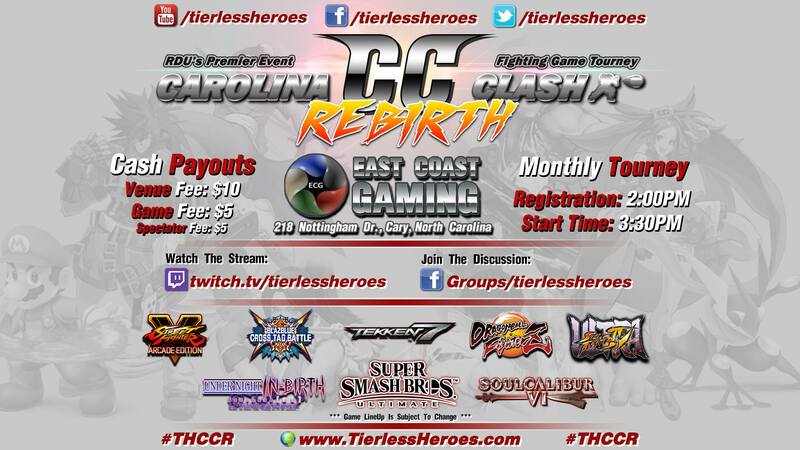 All the footage, graphics, photographs, and logos are property of Tierless Heroes and Carolina Clash Rebirth Fighting Game Tournament All Rights Reserved. By attending our event you are agreeing to the terms and conditions of using any images and footage for promotional and entertainment purposes. Fighting Game Characters and Franchises belong to their respective Gaming Developers.